Labor Day has decide to turn up the heat here and I decided something need to be done (and hopefully in a way that would result in a post). I to thinking about who does heat and holidays better than anyway and I immediately thought of Brazil, which in turn caused me to think our friend Karen who has spent more time there than was probably good for Brazil, but hey, it’s a big country. She was the one who taught me how to make and pronounce the “National Drink of Brazil” (sorry, I am pretty sure you can’t write about it without saying that at least once. I think there’s a governing board or something). Anyway, this is one of those incredibly simple drinks that reminds you of the magic of a good cocktail. At the core is Cachaça. 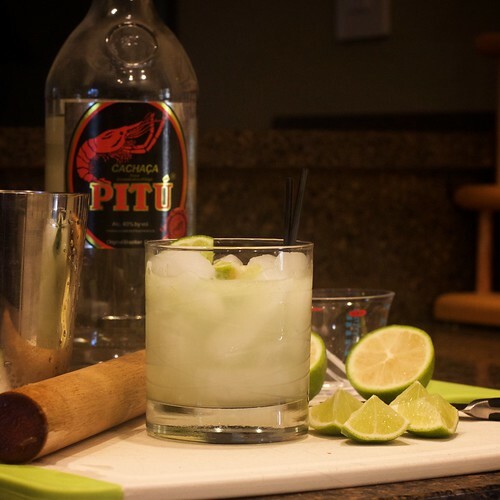 It’s Brazil’s version of rum and is a bit like light rum meets clear tequila. It definitely has a funkier more herbal note due to being made from sugarcane juice rather than molasses. It’s also a different way of putting a drink together in that you muddle and shake but then don’t strain. Muddle the lime chunks and sugar. Add the Cachaça and ice. Shake the cocktail and pour directly into a rocks glass. A couple of small straws work well as a garnish. This is one of those festive refreshing drinks that are really fun to make and to drink. I think it’s definitely found a spot in our regular rotation. *Superfine sugar is made by running a cup or so of regular sugar through your food processor until it becomes much finer and easier to dissolve, say a minute-ish.